Despite his 2008 pledge “to quash fear and promote dignity” among nations as opposed to the belligerency of the Bush years, the administration of President Barack Obama has seen the U.S. empire’s sanctions regimes continue unabated, and in some cases even expand. Whether it’s taking further steps to economically isolate North Korea over the unverified hacking of Sony Pictures (which exposed the film company as being staffed with racist jerks), taking measures to send Russia’s economy into recession as retaliation for its efforts to thwart NATO’s Ukraine-takeover, or sanctioning Venezuela for resisting another American-backed right-wing coup, truly fair and balanced diplomacy on behalf of the United States is simply D.O.A. Thus the imperialists resort to what they do best: arm-twisting, threatening and causing as much pain and suffering as possible to break the will of those who resist. Venezuelan President Nicholas Maduro vowed to resist U.S.-imposed sanctions, saying of the U.S. Congress, “They can shove their US visas where they should be shoved”. Similarly, the disappearance of 43 students in Mexico has drawn renewed attention to the country’s rampant human rights abuses, including those perpetrated by or with the complicity of the Mexican government, which the U.S. supported with nearly $3 billion in military aid through the Mérida Initiative and other bilateral programs since 2008. Colombia, another U.S. ally, also boasts an abysmal human rights record, but the country has received more than $8 billion in U.S. military and police assistance since 2000. Yet instead of imposing sanctions on these countries and its leaders, the U.S. continues to extend tens of millions of dollars in security aid. Furthermore, the Venezuelan opposition is not exactly what the American media portrays it to be. Venezuela has been in the cross-hairs of American imperialism for over a dozen years now since the socialist candidate Hugo Chavez won the democratic elections in 1998 and instituted societal and economic reforms which were greatly beneficial to the overwhelming amount of Venezuelan people instead of instead of being subservient to foreign national oil companies. The intense animosity the U.S. establishment held for Chavez was evidenced by the unrestrained tide of glee that met the news of his death in the corporate media. A decade prior to his death, the U.S. secretly organized a coup to oust Chavez and his socialist government from power in Venezuela in favor of the nation’s oligarchs, a coup that ultimately proved unsuccessful. The latest moves, including suspected manipulation of oil prices on the part of the Saudis at the urging of the U.S., are alternative methods of achieving the same goal. The violent opposition in Venezuela consists of elite oligarchs who wish to institute a counterrevolution in the country, and there is some evidence that they’re getting marching orders directly from Washington. In a sick twist of irony the U.S. House of Representatives passed the sanctions bill the day immediately following the long-overdue public revelation of the Senate Torture Report summary, which demonstrated once again that the only thing “exceptional” about the U.S. is its extreme hypocrisy. Not satisfied exerting as much damage to the economies of Venezuela, Russia and Iran as possible, the U.S. Military Industrial Complex in collision with its friends in Hollywood decided the time was ripe to ratchet up hostilities with North Korea. (*) After a group of hackers managed to hack into the private emails of several Sony Motion Pictures execs, claiming the attack was in retaliation for a despicable juvenile comedy flick starring Seth Rogen (The Interview) in which a gruesome assassination of North Korean leader Kim Jong Un is depicted onscreen. 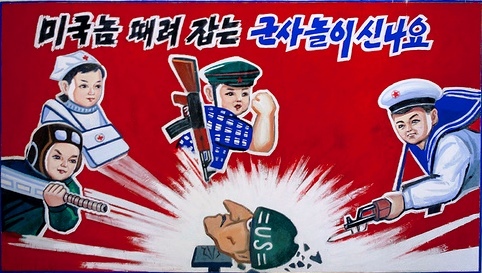 The warmongers at the Pentagon, Congress and the White House immediately seized the opportunity to verbally assault Korea by pointing the accusatory finger at Pyongyang, an accusation North Korea denies (though they certainly aren’t bothered by the leaks, nor should they be expected to be). President Obama, citing FBI ‘Intelligence’, declared he had “no doubt” the Koreans were responsible and threatened retaliation. (**) Soon after the internet was almost completely down in North Korea, and this was followed by additional sanctions on top of the numerous sanctions already piled against the small nation. In addition, the President said the United States would be considering whether it’s once again appropriate to add the Democratic Peoples’ Republic of Korea onto the U.S.’s list of “state-sponsors of terrorists”. If this were to happen, North Korea would effectively take the place only recently evacuated by Cuba and would stand alongside just 3 other nations: Iran, Sudan and Syria. Of course the fact that the U.S. even has such a list is nothing short of astonishing considering how U.S. ally Saudi Arabia is nowhere on that list, even though in 2009, according to a State Department cable later made public by Wikileaks, then Secretary of State Hillary Clinton referred specifically to Saudi Arabia as the lead exporter of terrorism worldwide. This assessment notably fails to take account of course the many armed terrorist groups which have been armed and trained by agents of the CIA who continue to wreak havoc across Syria, Libya and Iraq day by day. Add to that the troubling fact that a known Cuban terrorist, Luis Posada Carriles – responsible for orchestrating a number of deadly terrorist attacks against civilians in Havana – is currently living in Miami under U.S. protection despite killing scores of innocent lives. Not surprisingly, Carriles is a former CIA agent, and by association that makes the U.S. without a doubt a “state sponsor of terrorism”. What is the difference between Saudi Arabia and Israel on one hand, and Venezuela and North Korea on the other? It’s simple. States such as Venezuela, Cuba, and North Korea have not bowed down before the alter of Yankee imperialism and have instituted policies that are socialist, egalitarian and beneficial to their people without making them subservient to capitalist enterprise. Any nation that charts a path seen as antithetical to the interests of Washington D.C. and global hegemonic capitalism is automatically designated a target for the United States. The grotesque inequalities which are an inherent part of capitalism have only been exasperated as the U.S. has become the world’s sole remaining superpower following the downfall of the Soviet Union in 1989. Resistance to empire and the determination of a people to set up a path of their own choosing have not diminished, however. No amount of invasions, sanctions or foreign-backed coups will ever be enough to extinguish a peoples’ fight for self-determination. 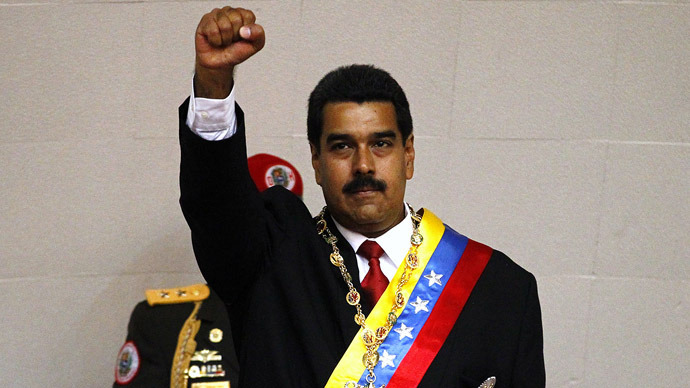 Is US Supporting Oligarch Coup in Venezuela? Sony Pictures co-chairman Michael Lynton is on the board of trustees of the Rand Corporation, a leading private consulting firm for the CIA and Pentagon, and it was Rand’s North Korea specialist, Bruce Bennett, who pushed hard for the Sony film to focus on the assassination of North Korea’s ruler. Other emails name two State Department officials—Assistant Secretary Daniel Russel and Ambassador Robert King, US special envoy for North Korea human-rights issues—as providing input to the film. ** Such “intelligence” is doubtful at best, considering how the U.S. government has a way of fabricating evidence to fit a preconceived narrative. Take for example the supposed “Gulf of Tonkin” incident which was fabricated and used to justify further involvement in Vietnam, or the fictional WMDs the Bush administration insisted were about to be used by Saddam to justify the U.S. invasion of Iraq. Sometimes I wonder how someone as hypocritical as Obama can live with himself. Well, to be honest I know the answer. It’s the same way that 43 Presidents before him were able to live with themselves. Being a hypocrite is in the job description (or should be) of being a U.S. President. There is truth to that. But Obama ran as a president who would “change the game.” He was going to be “transparent.” Many of us believed the “Hope & Change” riff. How disappointing it is to get just more of the same. Yes, I wanted to believe as well. But then again, I guess it goes to show now more than ever that our political system is too corrupt to ever expect it can be fixed from within. It has to be replaced completely, because it’s too broken to be reformed. Nicely done Caleb. I think that warmongering and sanctions/regime change should be considered as crimes against humanity. However that is just me. Couldn’t agree more. The only time “regime change” is justified is if it comes from the collective effort of the people who live under the regime, certainly not at the hidden hands of a foreign empire. At it again …. SMH!! Whatever happened to “world peace”? Indeed!! It’s quite lost amisdt all the orher words: conflict, war, greed, profit, etc. …. you name it. Indeed, and until people give up obsessing over war, greed and profit, there can be no peace in the wold.